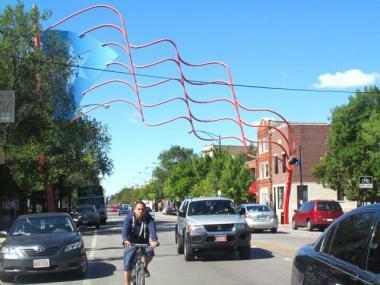 A sculpture of the Puerto Rican flag hangs over a stretch of Divison Street, the Humboldt Park neighborhood's El Paseo Boricua. CHICAGO — A recent study of Puerto Ricans living in Chicago concludes they are faring better in some ways than Mexicans and African Americans but not as well as whites. The authors of the study also have a number of recommendations, including establishing more affordable housing on the city’s Northwest Side, especially in Humboldt Park, Logan Square, Hermosa and Belmont Cragin. In that area, median monthly rent increased 27 percent over the last nine years while incomes increased only 17 percent, the report says. Gentrification also poses a problem, they said. Those four communities account for almost half the 103,000-member Puerto Rican community in the city, according to the report, “60 Years of Migration: Puerto Ricans in Chicagoland,” produced by the Puerto Rican Agenda. 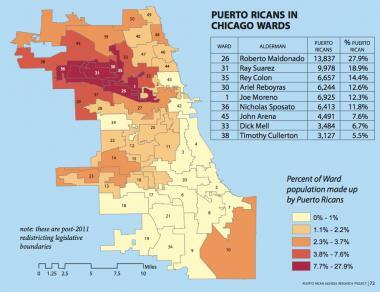 This map shows where Puerto Ricans live in Chicago by ward. The report was supported by the University of Illinois at Chicago, the Local Initiatives Support Corp. and the Chicago Community Trust. On Friday, UIC hosted a forum on the report. ♦ INCOME: In the city, the median household income for Chicago Puerto Ricans is $39,290 compared with $44,776 for all city residents. City residents of Mexican descent had a median household income of $39,988, blacks were at $29,371 and whites at $58,750. About 27 percent of Puerto Rican households receive food stamps, compared with 20 percent of Mexican households, 33 percent of African-American homes, and 8 percent of white households in the city. Some 30 percent of Puerto Rican children live in poverty, 1 percent less than Mexicans, 18 percent less than African Americans, but 10 percent more than white kids. In 2010, 9 percent of Chicago Puerto Ricans were unemployed — more than Mexicans (7 percent) and whites (5 percent) but less than blacks (11 percent). 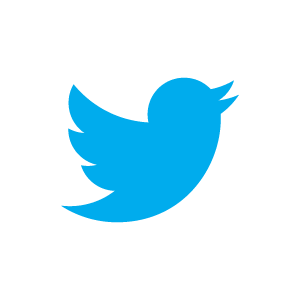 ♦ EDUCATION: Dropout rates decreased by about 12 percent from 2000 to 2010, but the 32 percent dropout rate for Puerto Ricans in Chicago still is higher than the rate for blacks and whites. About 13 percent of Puerto Ricans in Chicago have a college degree compared with 9 percent of Mexicans, 18 percent of blacks and 45 percent of whites. Chicago Public Schools in Puerto Rican areas score lower than statewide averages. The report authors said Latinos and African Americans are more likely to hold high-cost loans than whites. ♦ HEALTH: In Humboldt Park, Puerto Ricans are at high risk for asthma, diabetes and high blood pressure. Some 72 percent of Humboldt Park Puerto Rican adults are overweight and some 67 percent of their children are overweight. Almost 90 percent said they would be embarrassed to be seen exercising. ♦ GANGS: While police say the two districts most identified with Chicago's Puerto Rican community — Shakespeare and Grand Central — are seeing a decline in juvenile arrests, “Almost everyone we talked to had a personal story regarding some sort of experience with gangs,” the researchers wrote. Because of fear in Humboldt Park, one woman told researchers, “There’s no sense of community anymore” because people hide in their homes. "It's not like 'Hey Judy, hey Carmen, let's get together.' There's no more of that anymore," the woman said. In 2010, the Grand Central District had the second-highest number of Latino juvenile arrests in the city. The report's authors recommend more "restorative justice" approaches — an effort that usually focuses less on jail time and more on repairing the damage done to victims. ♦ BUSINESS: In interviews, business owners in Paseo Boricua, the Puerto Rican business area on Division Street between California and Western avenues, complain the city is not doing enough to promote the area as a tourist destination. The researchers recommend establishing credit unions to help provide needed capital to Puerto Ricans in Chicago.